Make sure your business gets a head start in these times of high competition by dressing your staff in our Customised Embroidered Work Shirts. All you have to do is to choose which style and colours will suit your business the best and we'll see that they get embroidered with your business details and company logo. 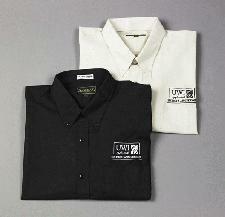 Also available in: White shirts, Office shirts, Oxford shirts, long sleeved shirts, short sleeved shirts, and uniforms. To find out more about our Customised Embroidered Work Shirts click here and fill in the contact form and we'll get straight back to you. Other promotional and personalised items besides our Customised Embroidered Work Shirts click here.